Cuatro Cuatros has been one of those places that we have been day dreaming about. We make day trips down to Valle de Guadalupe at least once a month, but spending the night, and turning it into a getaway doesn't happen nearly as often. The Valle has always been a place where I can truly let go of our busy day to day schedules, take in some deep breaths, and appreciate nature more than ever. Our two little ones enjoy it just as much as we do, which definitely makes for an all around wonderful experience. While Cuatro Cuatros is not technically in Valle de Guadalupe, and actually located El Sauzal, it is only about a 15 minute drive into Mexico's wine country. Giovanni has been asking us to take him camping ever since a couple of summers ago. I know I know, we started him off on the more glamorous side of things, when it comes to the really "roughing" it part. What, not all tents are equipped with king sized beds that are fluffier than clouds, and your own bedside heaters? The day we arrived was gloomy, a bit chilly, and rain was expected later on that evening. I wouldn't normally voluntarily ask to go camping in the rain, but truth be told, the entire trip worked out perfectly. There is still such a majestic beauty to be seen, as the fog and clouds roll in over the expansive green vineyards, and hillside. We checked-in, unzipped the front of our cabana/tent, and set our things down before heading off to lunch in the Valle. The interiors of the tents are inviting, with modern and warm touches. Each tent is equipped with its own bathroom and shower. (Which was a question, I received from inquiring minds, after we returned home.) It's really neat that the showers are surrounded by clear glass, so you can still feel at one with nature, without fully standing in dirt, or freezing during the whole process. There is still such a majestic beauty to be seen, as the fog and clouds roll in over the expansive green vineyards, and hillside. As I mentioned previously, we rented a two bed tent, both king sized, which was also furnished with a sofa, and your own chimney. As soon as the sun began to set, one of the property's staff comes to turn on your heaters, and asks if you would like the fire started in your chimney. It rained throughout the night of our visit, which made for an even more relaxing stay in my opinion. The pitter pattering of rain off of the tent was like music to our ears. To those wondering about warmth, we were more than warm enough during the night time. The Cuatro Cuatros property has its own restaurant and vineyards.You can even have your meals delivered right to your cabana, and if the weather is right, dine al fresco on your own personal deck. Come morning time, all was dry, and we headed for a quick walk across the bridge towards the restaurant. Giovanni made sure to collect as many rocks as possible, and Camila squealed at every bird she heard chirping. The restaurant itself carries on the whole theme, cabana exterior, with wooden tables, and hide covered chairs on the interior. Quaint and charming. It was huevos rancheros for Antonio, chilaquiles verdes for me, and the kids split a plate of pancakes and eggs. Between sips of hot coffee, and bites of breakfast very few words were spoken. That's always a good sign to me. The overall experience at Cuatro Cuatros was definitely one for the books. On our drive home up the coast, I was already talking about possible summer trips back down there. Balmy warm nights, filled with roasting marshmallows, sips of local wine, and great conversations await! Giovanni still talks about it, and even wants to invite his friends down to be tent neighbors. 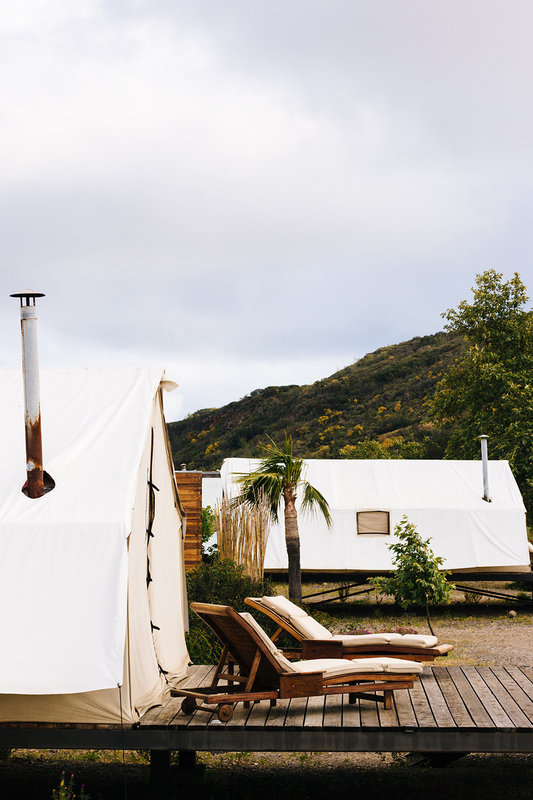 Cabañas Cuatro Cuatros | Map | Web El Tigre, carretera libre Tijuana-Ensenada Km. 89 s/n El Sauzal de Rodriguez, Ensenada B.C., México.